Mr. Hastings, who has been practicing law for almost 35 years, concentrates his practice on personal injury law. Attorney Hastings has been named one of the top 10 lawyers in the state of Connecticut for client satisfaction. 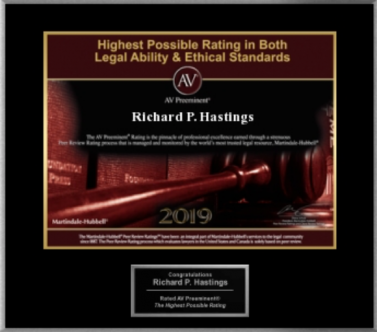 RIDGEFIELD, Conn. - Nov. 19, 2018 - PRLog -- Richard P. Hastings, a partner in the Ridgefield, CT law firm of Hastings, Cohan & Walsh, LLP has once again received an AV rating by Martindale Hubbell, its highest rating. Mr. Hastings, who has been practicing law for almost 35 years, concentrates his practice on personal injury law. Attorney Hastings has been named one of the top 10 lawyers in the state of Connecticut for client satisfaction. He is listed as one of the top 100 trial lawyers in CT by The National Trial Lawyers. Mr. Hastings has been named a Connecticut Super Lawyer and a New England Super Lawyer. He is a member of the Million Dollar Advocates Forum. Attorney Hastings has also been named to multiple other best lawyers and top attorneys lists. Mr. Hastings is a Harvard trained negotiator. He has also received mediation, negotiation and alternative dispute resolution training through MIT, the University of Michigan, Quinnipiac School of Law, and the Windsor Faculty of Law in Canada. As a result of his extensive training, Attorney Hastings teaches lawyers across the country how to get more money for their clients personal injury cases. He has also taught lawyers across Connecticut, in a live presentation, negotiation tips and techniques to maximize their clients personal injury recovery. Attorney Hastings has received patent pending approval for his business method patent entitled "Personal Injury File Acquisition Method, Client Education Program and Case Referral System." Mr. Hastings is the author and/or co-author of 12 books. He has published hundreds of articles on a variety of personal injury and medical malpractice topics, was a syndicated legal columnist, and has published hundreds of educational videos on accident and injury law. He has also published articles in the Connecticut Law Tribune and the New York trial lawyers magazine Bill of Particulars. Attorney Hastings is the co-author of Wolf in Sheep's Clothing which was #1 on the Insurance Best-Seller list on Amazon.com for its launch date. He has also been inducted into the National Academy of Best-Selling Authors. Mr. Hastings is a graduate of the University of Connecticut and Fordham University School of Law. He can be reached at 203-438-7450 or by visiting his website at www.hcwlaw.com.